If anyone knows how to identify a quality dealership, it’s Edmunds. This site is dedicated to providing people with the information they need to be well-informed consumers, and that includes learning more about prospective dealerships. When they have five stars on 20 reviews or more, in addition to being part of the Edmunds Dealer Program and keeping up a 4.5-star average over the past two years, only then can a dealership secure this prestigious title. Walter’s Mercedes-Benz of Riverside was awarded this honor in 2017, 2018 and again in 2019. This awarded is presented to a select group of car dealerships that have received the highest average ratings from shoppers who have submitted dealership reviews on the CarGurus platform. CarGurus uses shoppers’ dealership ratings as well as comprehensive valuation analytics to help shoppers search their local marketplace and find great car deals from top-rated dealers. Walter’s Mercedes-Benz of Riverside is honored to be awarded this in 2018. 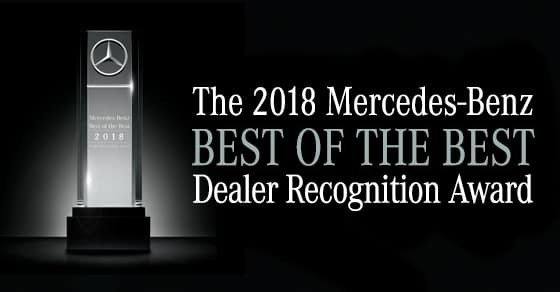 Awarded annually, the Best of the Best program honors top-performing Mercedes-Benz dealerships for demonstrating excellence in all areas of business including sales, service and parts, operations, and customer experience.